Mediterranean Antipasto Herb Pasta Salad Platter was a delicious surprise at our pitch-in birthday fish fry. We guessed Jason, our son, would bring either his special Four Cheese Macaroni or his Antipasto Tray. We didn’t care which one because both dishes always seem to magically disappear the minute they hit the table. 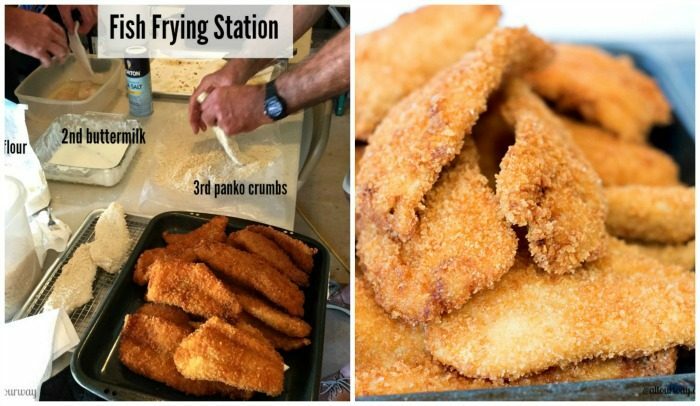 Would you like to know our recipe for a fantastic birthday fish fry? Jason brought neither of those dishes. Our son brought something better, a pasta salad platter that combined our favorite southern Italian flavors — grape tomatoes, olives, cheese, spicy salami, pepperoncini,fresh herbs, and pasta tossed with a Greek dressing that complemented but didn’t overwhelm the ingredients. Now a pitch-in fish fry for a birthday party may seem a little odd, but we wanted to use up the flounder and sea trout in our freezer before we left for the Fall fishing trip. Reid, our youngest son, volunteered to host. We packed the SUV with the fryer, fillets, peanut oil, and the fish coating and headed north to Reid and Lauren’s house. We love cooking for the family. The family loves how Honey makes his crispy fish fillets; I’ve yet to taste any better. 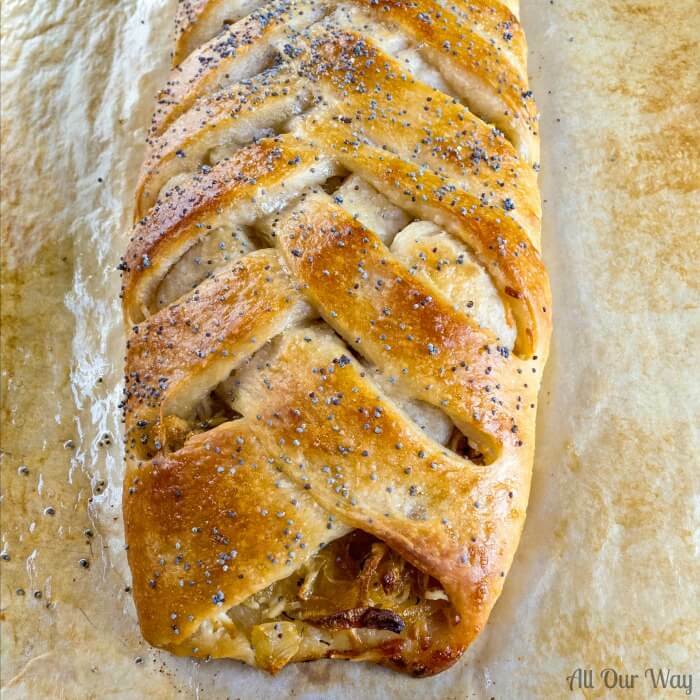 could add just about anything to the caramelized onion filling and it would be outstanding. We were celebrating two birthdays. 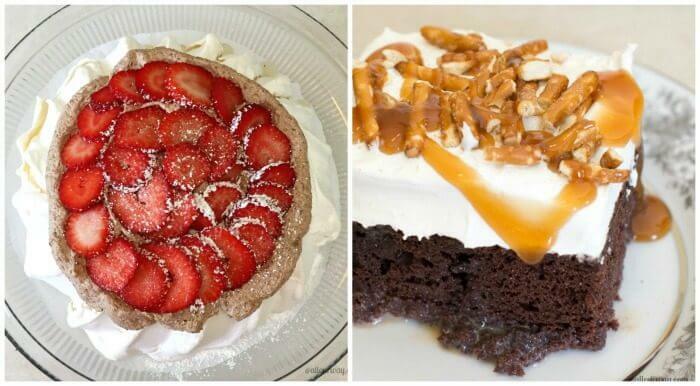 So Lauren, my daughter-in-law, made two birthday cakes, a Strawberry Pavlova and a Salted Caramel Chocolate Poke Cake. Lauren got the idea for the Pavlova when several months ago I shared Alida Ryder’s recipe photo on Facebook and mentioned I wanted it for my birthday. The minute Lauren saw my comment she said she’d make it. Oh my goodness, both cakes were heavenly! I’m making them and posting the recipes here. Next time you want a pasta salad, try out Jason’s recipe, it is a delight for the eyes and the tastebuds. Be sure to sign up for our weekly newsletter so you don’t miss out on what we’re cooking up in our kitchen. We’re excited about sharing more delicious recipes. 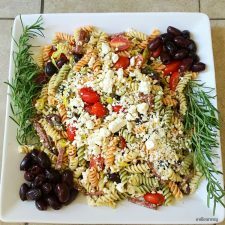 An easy pasta salad that combines the delicious flavors of the Mediterranean such as kalamata olives, feta, grape tomatoes, spicy salami, southern Italian herbs, and pepperoncini all tossed with a Greek Feta Dressing. Make the pasta but leave it slightly under al dente. When the pasta cools add 3/4 of the Greek dressing. The pasta will absorb the dressing. Add the grape tomatoes, hard salami, 4 oz. of the feta cheese, halved kalamata olives, sliced pepperoncini, and herbs. Gently mix together. Add the rest of the Greek dressing and let it rest so the pasta can absorb the dressing. Scoop the pasta onto a nice platter. Top the pasta with the rest of the feta cheese. Place the whole olives on the platter and garnish with the rosemary sprigs. Note: Recipes and content from © All Our Way are copyright protected. Please do not use content or recipe without prior written permission. If you want to share the information, please link to this post. Grazie! I’m loving all the Mediterranean recipes you are posting Marisa. This looks so good. My kids love anything dipped in egg and breadcrumbs. This salad is one of the best that I have ever seen. Incredibly interesting ingredients and it’s a good idea for lunch. Of course I want to try because it looks very tasty. Mmm what a unique salad recipe! I like all the ingredients in it. This is perfect for me. This is so delicious and it makes my mouth watering. I would devour everything on that plate!! Something like this is my idea platter for holidays! Wow, what a stunning platter! I’m not a fan of olives, but I would devour everything else on the plate. 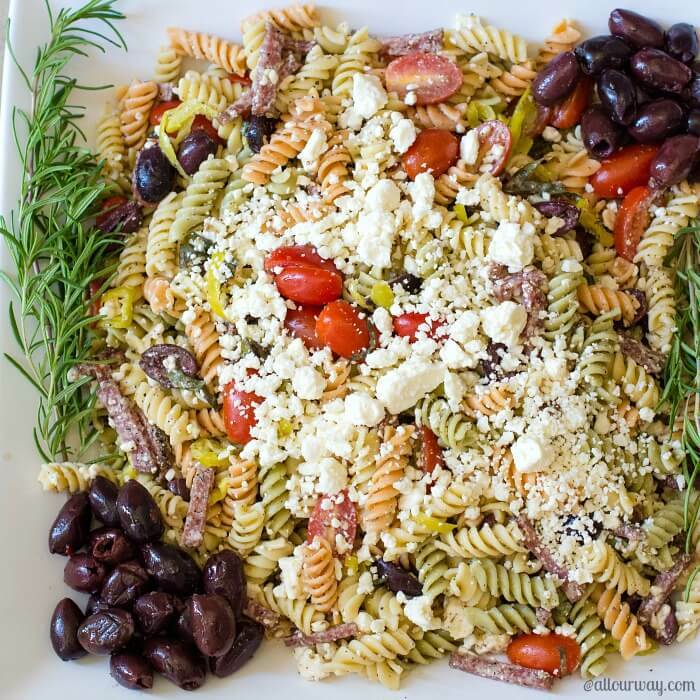 I love pasta salad, and I love that you include my two favorites- feta and OLIVES! No salad is complete to me without olives. Nicely done! This will be perfect for holiday parties with my family. 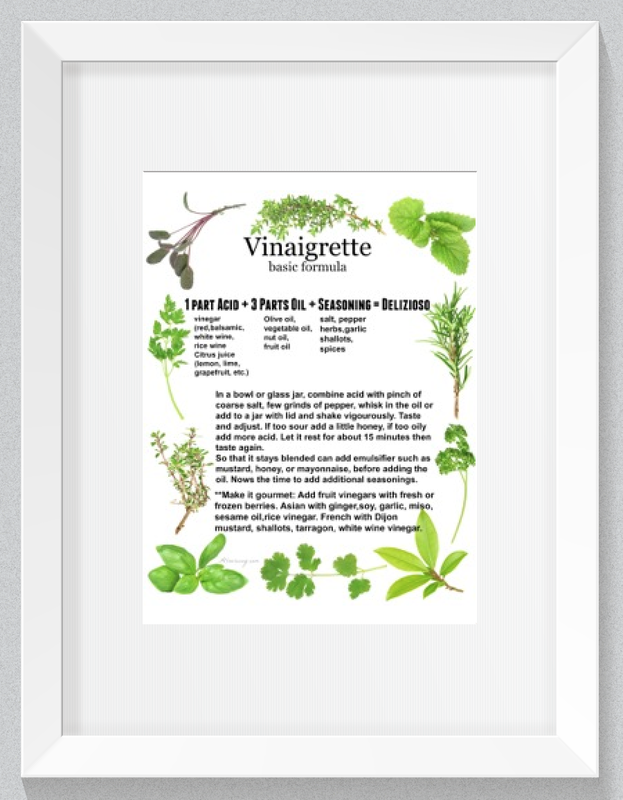 They will love it & I love not only the variety it will provide, but how easy it is to make. I hope you had a great 4th of July Marisa! That will be great being closer to your family and it’s so nice when they pitch right in and help when needed! Don’t worry about your blog…it will still be there. As for requests, I’m always looking for tried and true quick breads…bundt cakes…cakes etc. Family favs are nice too. Way too hot to bake now though! Lol. Hello!! Yes, it is hot to do a lot of baking right now and I’ll be glad to start the cooking/baking once we get situated. I’ve got some great recipe ideas. Stay cool!! It is a scorcher here today!! Same to you, Jovina!! Have a wonderful day. My favorite flavors all in one place! 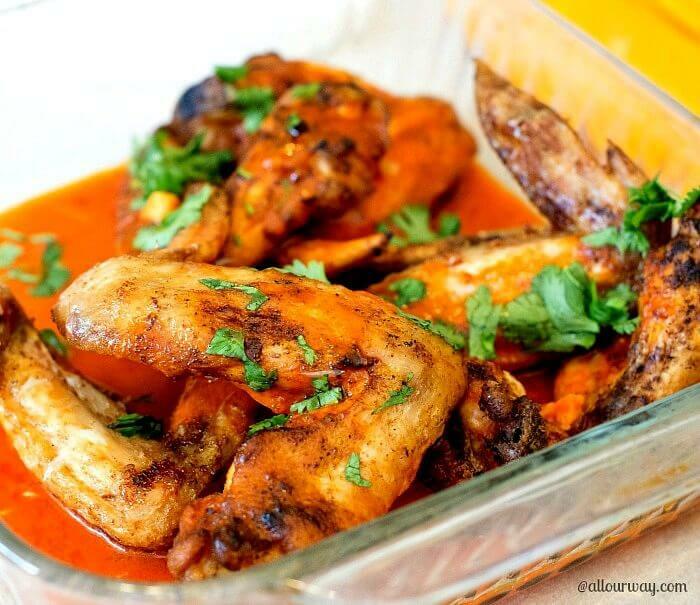 This recipe’s a keeper!! Thank you, Annie! We love those flavors too. Happy, Happy (belated) Birthday Marisa!! Given that amazing feast – I have a feeling that you all had a wonderful, beautiful day . . . with full, happy tummies! Seriously, your menu looks and sounds amazing! Y’all really know how to bring it all together! We could learn from you!! Lol! I hope your fishing trip is a success! Thank you, Suzanne! I did have a very happy birthday. As far as fishing goes? We have evacuated and are waiting out Matthew! :-( It’s supposed to hit our area late afternoon Friday. We are praying it turns out to the Atlantic. Sending big hugs back! I love the fusion Italian/Greek, this salad looks so tasty ! Thank you, Chiara! Our family likes the combination also. What a bright, colorful pasta! Thanks for sharing. Sounds like you had an amazing birthday Marisa and what delicious food. I know we will all love the Pasta salad. Looks so good. Thank you, Rosemary. I did have an amazing birthday. Love spending it with the family. I can make a whole meal out of an antipasto plate—-and sometimes I do! Adding Pasta just kicks it up a notch!! I can’t wait to try this recipe. What a “FESTA” you had for your birthdays. Everything looked so scrumptious—-it’s making me very hungry! HAPPY BELATED BIRTHDAY to you and your son, Jason……and wishing many more for you both! What a terrific salad. My kind of eating. What a delicious feast you had. WOOOOOOWWWWW! Every pic had my mouth watering and it’s only 9 am. I’ll never make it to lunch. It all looks delicious and your family sounds wonderful. Happy belated birthday, it sounds like you all had a great time!